Ask the Expert. . . What is the Hantavirus? The Hantavirus is virus carried among certain types of rodents and can cause you to become very ill and can even be deadly if you come in contact with it. 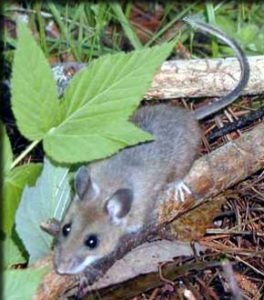 In the Northwestern part of the United States, the Hantavirus is typically carried by Deer Mice. Certain strains of the virus can lead to a deadly condition known as Hantavirus Pulmonary Syndrome or HPS. HPS is very rare, but better safe than sorry! Keep in mind, pet mice, gerbils, guinea pigs, and hamsters are not associated with the Virus or HPS. Click on the image to learn more about the Deer Mouse. Typically, the Hantavirus is passed when a person comes in contact with mice droppings and/or is bit by a mouse already carrying the pathogen. The virus is spread through the air and can be contracted by breathing it in. It’s important to note, that everyone is susceptible to the virus, not just those who have a weak immune system. Now that you are totally freaked out . . . calm down, take a deep breath (in a mice free area), and keep reading. To avoid coming in contact with the virus, keep your house and other outbuildings free of mice. Take special precaution around mice droppings, urine, and salvia. If you have found a small amount of mouse droppings, clean them up properly and disinfect the area. Avoid vacuuming or sweeping up any droppings if possible. Make sure you wear heavy duty gloves, a mask, and allow the area to vent for at least 30 minutes before working in an affected area to ensure good air circulation. For large messes or for fuss free cleanup, call ARS to safely cleanup, disinfect, and restore any areas effected by mice. For more information on the Hantavirus and HPS, visit the Center for Disease Control’s Website or view their web brochure on the virus located in the link below.